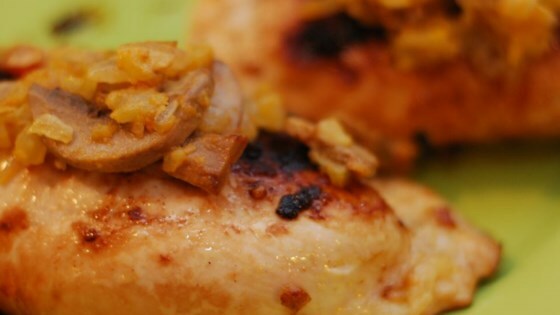 "A delicious stuffed chicken recipe that uses about two breasts per person. Serve with rice and stir fried veggies, if desired." In a small skillet, heat vegetable oil. Saute onion and celery until tender. Stir in hot sauce and mustard and mix all together. Remove from heat. Cut pockets into chicken breasts and stuff with onion mixture. Saute chicken in skillet 2 to 3 minutes each side, until lightly browned. Remove from skillet and grill over medium high heat for 10 to 15 minutes on each side, or until juices run clear. Serve with remainder of onion mixture as a sauce/topping. This was great as is. We used large breasts and needed to increase the stuffing. Next time I will double or triple the stuffing. Super simple & super easy. I added achiote and garlic powder to the celery/onion mix. Next time I will double the veggie mix . Hub ? ?‘d it asked for extra. Will def make again.